TV Review - Iron Fist - Honk if you love justice! I finished Marvel’s latest Netflix series, Iron Fist over the weekend, and I have a lot of mixed feelings. I became a fan of Danny Rand fairly late, having read the Brubaker/Fraction/Swierczynski/Foreman Immortal Iron Fist series after loving Fraction/Aja’s Hawkeye and Brubaker’s Cap run. That series pushed a lot of my buttons, since I loved the old Kung Fu TV show (and even the sequel series), martial arts TV and movies in general, and the greater Marvel universe as a whole. Having said that, as an adult I now know that the set up for Kung Fu and similar media is problematic. There was talk that Iron Fist might subvert the source material’s issues by casting an Asian man as Danny, but Marvel played it safe. Having seen the guy they were considering (Lewis Tan), I wish they’d taken the chance but here we are. I’m not going to hammer them on this point (as many other reviewers and pundits have done so eloquently) but for a company that has led the way in so many other ways with the explosion of comic book media, it’s perplexing that they are going to lag behind on something like this. Comics! Anyway, Danny returns to New York City and attempts to restart his life there – trying to get Rand Enterprise back, reintroducing himself to Ward and Joy Meachum (childhood friends/frenemies and the children of his father’s business partner, Harold), pestering dojo leader Colleen Wing, and generally making a nuisance of himself. The earliest episodes felt the weakest to me. I don’t think Finn Jones as Danny Rand was all that strong at the emotional aspects, though perhaps those directors were not pulling in a strong performance from him. The action is weakest in these episodes as well, though Jessica Henwick as Colleen shows a bit of skill. Still, I found myself most interested in Harold Meachum (yeah, he’s not dead) and his manipulation of events. And make no mistake, Danny is very easily manipulated. Despite numerous times this causes him trouble, he repeatedly trusts someone right after they do something somewhat nice for him, or just because it’s a person he knew in the past. This despite the fact that one of the reasons he left his post – he’s supposed to be guarding the entrance to his mystical adopted home of K’un-Lun while it’s open – was he didn’t want to be a tool used by others. I think they wanted to show how naive Danny is, with half of his youth spent apart from our society, but he seems to integrate himself back in fairly easily otherwise so it doesn’t quite work. I know a lot of this sounds negative, but the show does pick up in the back half. The action improves quite a bit. I wasn’t surprised at all to see that the episode with one of my favorite fights (drunken boxing!) was directed by Kevin Tancharoen. We get our requisite Claire Temple appearance, big reveals about the Hand, Madame Gao, Colleen Wing and Davos. It DOES end on a pretty enormous cliffhanger, but Iron Fist perhaps suffers more than the previous Netflix/Marvel shows because it’s also pulling duty as the lead-in to the Defenders. In the end, Iron Fist is probably a 3 out of 5. Luke Cage (which I should probably re-watch and talk about here) is a notch above, and Jessica Jones and both seasons of Daredevil above that. 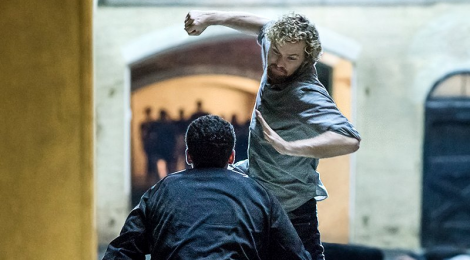 My next post will be a look ahead, at what the future should hold for Danny if there’s another Iron Fist season. I liked it. I never read the comic, so I went in not knowing the story or having any expectations. The first couple episodes were a little slow, but the story needed the time to build. I loved the drunken boxing scene too. My biggest knock on the show is the actor playing Harold Meacham. He is extremely annoying. Oh also, Danny”s martial arts ability seems to adjust with the level of competition. Whether it’s a high ranking member of the hand, or a peon security guard, whenever there’s a 1 on 1 fight, he always seems to just barely win. Yeah, they’re pulling an Avatar Aang here, where Danny has the power of the Iron Fist but not enough training. 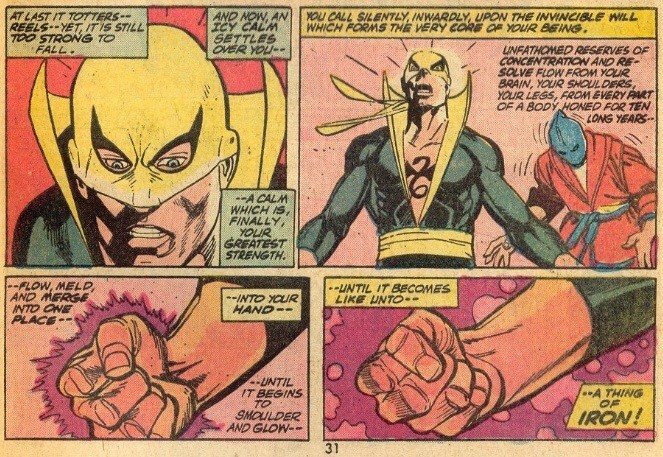 As you saw in the video from the forties, the previous Iron Fist was able to light up both fists and keep fighting.